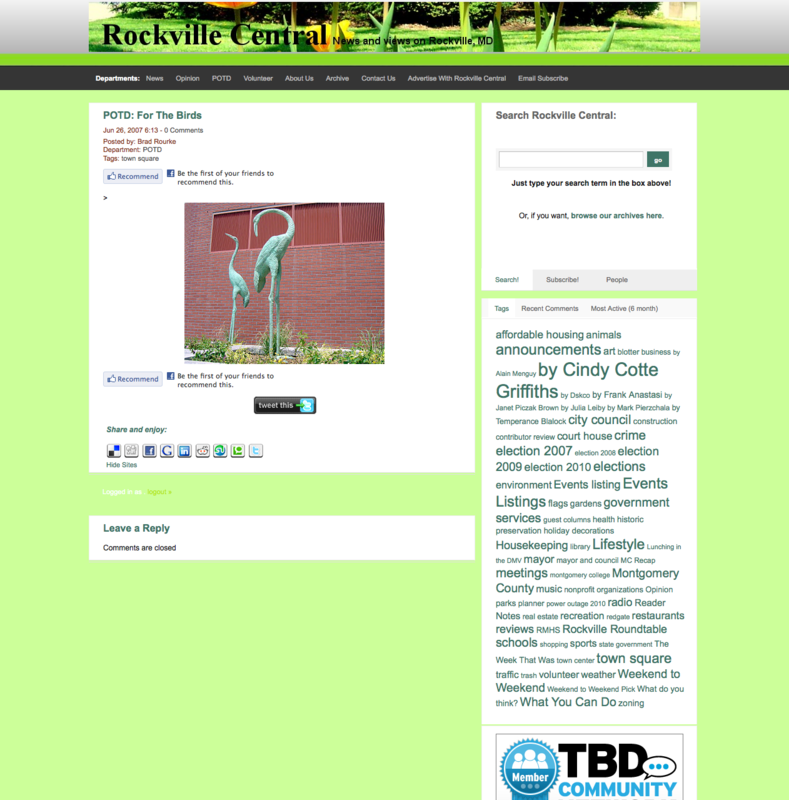 Over the following years, it had grown, matured, and morphed by producing an internet radio show and YouTube videos, plotting police reports and real estate listings on maps, collaborating with other online communities (such as Lunching in the DMV and Rockville Living), reporting on City Council and other community meetings, creating editorial cartoons (one of Cindy’s signature elements), welcoming guest opinions and contributor reviews, hosting Rockville Roundtables and a City Council debate (one of the best), and moving to Facebook. It takes a great deal of energy and time to support the online community in the way we feel it deserves. We do not make money off of Rockville Central, and never intended to. It is a labor of love and devotion to Our Fair City. We don’t feel we can devote the kind of energy it deserves and so, rather than let it whither, we decided to make a clean end. Rockville Central helped identify the important news in the community, facilitated discussions in a civil and respectful manner, made us see our town in new and interesting ways, and introduced us to the many thoughtful and socially-active people who live in Rockville. I’ll miss Rockville Central this year, but thankfully, Rockville still has Brad and Cindy. 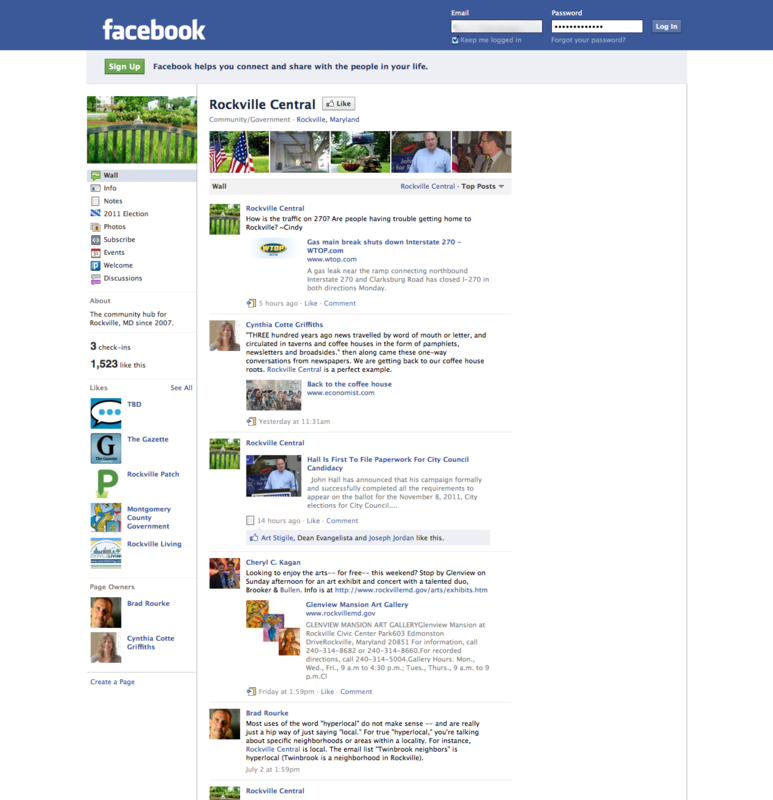 Rockville Central on Facebook: A Step Forward, Back, or Sideways? Six months ago, Brad Rourke and Cindy Cotte Griffiths moved Rockville Central from a standalone web site to Facebook to both go where most of their readers were and to allow for more convenient interaction among readers. Founded in June 2007, within a couple years Rockville Central had become one of the top five local blogs in Maryland, but now that it’s moved entirely and exclusively to Facebook, how has it fared? I took this week off from work to devote my energies fulltime to the campaign. I spent five days walking precincts (I think I visited two thousand homes), attended three forums, and responded to questionnaires in the time remaining. I’m exhausted–I don’t know how the other candidates did it (Piotr Gajewski seemed incredibly peppy at the King Farm Forum, but perhaps that’s because he was on home turf). I was elated that it rained this afternoon and I forced off the streets. Tomorrow is the penultimate forum, this time with Rockville Central at the new Thomas Farm Community Center on the west side of 270 starting at 9:30 am. From the description of format, it should be a bit unusual (at one point, we’ll draw names from a hat and ask another candidate a question–should I be nice or naughty?). The eighth and last forum for this election season will be next Thursday, October 29 at the Rockville Senior Center. They’ve all been well attended so if you haven’t been to one, you have two more chances.